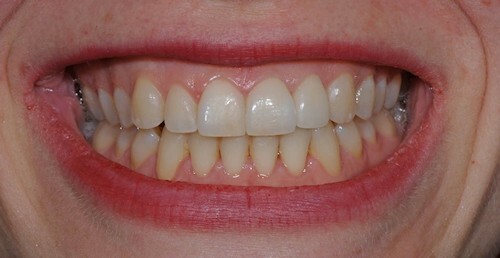 Unlike traditional crowns, which have an internal metal coping which causes graying of the gum or a visible dark line if there is gum recession, today we can offer high strength All-Porcelain Crowns (Zirconia or e.max) which are bonded to the tooth and have similar optical properties to tooth enamel. 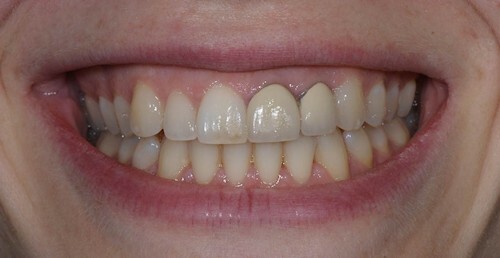 All-Porcelain crowns are indicated in situations where little enamel remains for bonding or where major changes in colour or shape are necessary. Pola has had the disfiguring metal-ceramic crowns on her upper left incisors replaced with All-Ceramic e.max crowns, eliminating the dark line at the crown margin and restoring nature.